Medium - $64.99 Only 7 left! Large - $64.99 X-Large - $64.99 Only 4 left! So, you got a stocking full of coal coming your way this year. While some people may want to hide this fact, you’re naughty, remember? So you’re bound to embrace your inner bad boy and boast about it a bit. 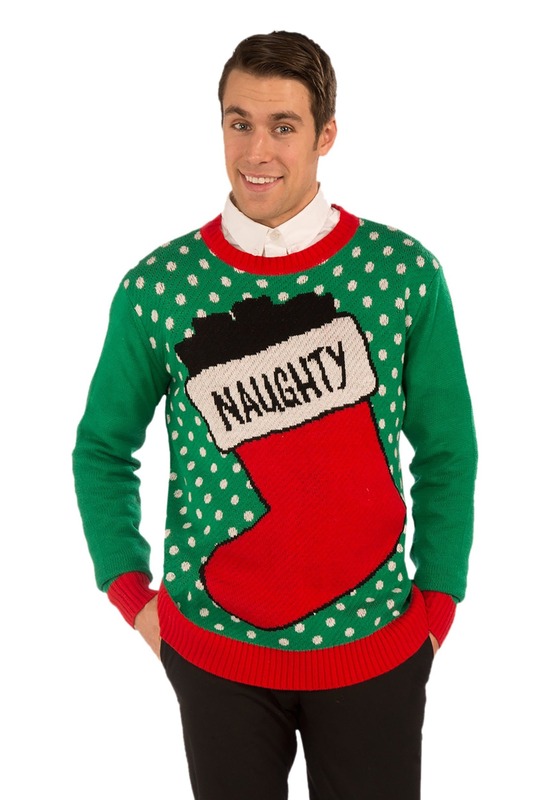 This Naughty Ugly Christmas Sweater may seem festive with its cheerful pine green and Santa red color scheme, but look again, pal; the front has a big ole’ coal-filled stocking with the word “Naughty” emblazoned big and bold for all to see. So what, you say! Being nice is...well, nice...and all, but being naughty is oh so much more fun--so go for it! Take an extra sucker (or five) from the bowl at the bank, drink the last of the milk and put the carton back in the fridge, Irish goodbye your pals at the pub, eat a whole box of Mac n’ Cheese right out of the pot while watching trashy reality shows. We have to admit, we kind of like you like this...you seem less wound up and more rebellious! Whether this whole “naughty” persona is an alter ego or all an act, we guess you’ll get a rave review for your fashion choice at a low key gathering or Christmas sweater party. Deep down, we all want permission to be a little more naughty. By wearing your lumps of coal right where we can see them, you’re telling us it’s ok not to be nice 100% of the time. And truly, that may just be the nicest gift you can give this holiday season.